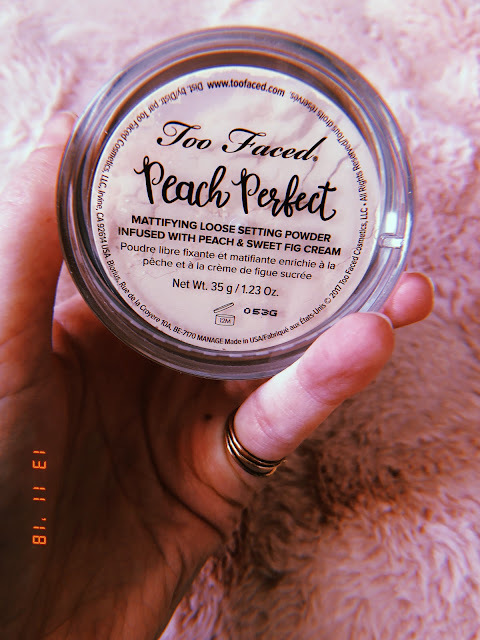 Hello you wonderful lot, today I wanted to chat to you about a foundation that I have just bought aswell as the mattifying powder from Too Faced Peaches and Cream Collection. As you may know by now I have tried quite a few of them and I was looking to try out the Too Faced Peach Perfect Foundation as I bought the primer during the summer and was really impressed with it so I wanted to do a little review just to see how I thought about the foundation and the mattifying powder aswell. The transfer-resistant medium coverage foundation creates a smooth canvas for flawless, comfortable matte wear using exclusive comfort matte technology that is never cakey or mask-like. I bought the foundation online but I had spent so many hours looking at the different kind of shades on the Too Faced website and I decided to buy the lightest shade in the Peach Perfect Foundation called Snow. The shade snow is for very fair skintones and for rosy undertones and matches my skin perfectly. 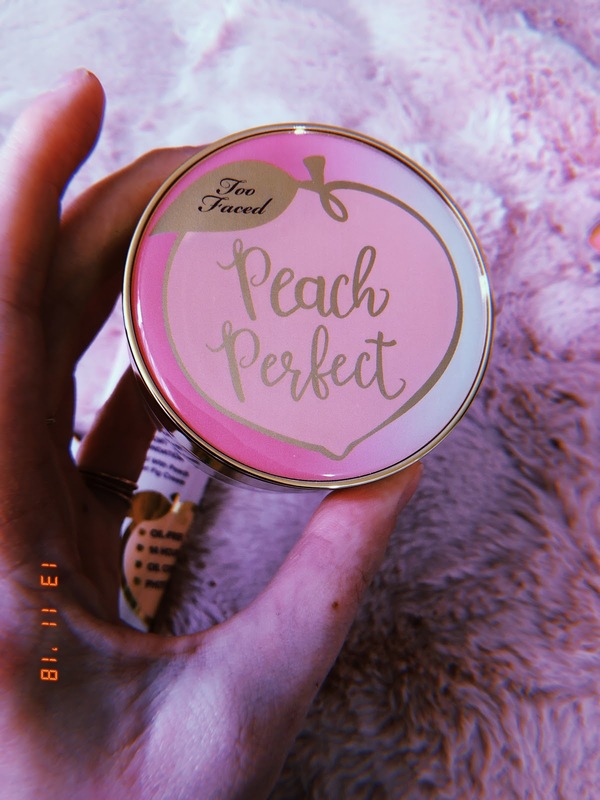 There are 12 shades available in the Peach Perfect foundation range. 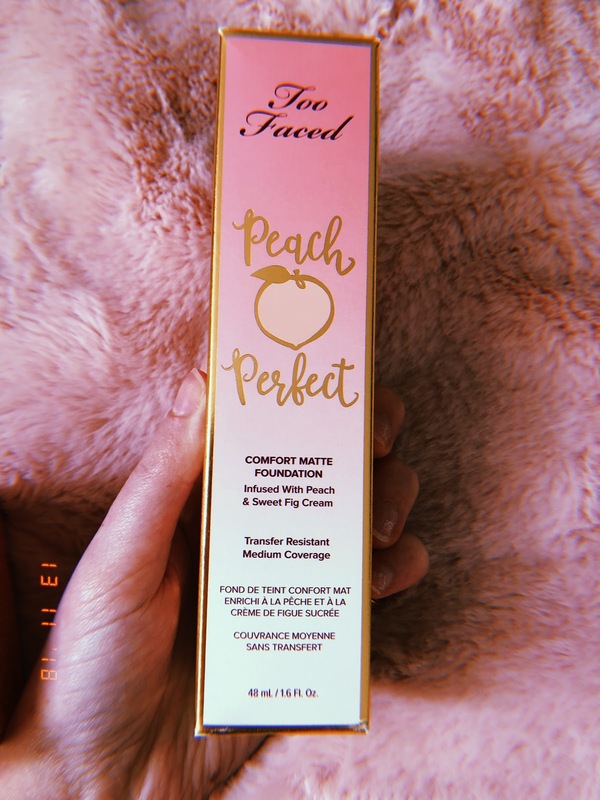 Too Faced do recommend applying the foundation with a sponge or using a makeup brush, I tried out both of these and I feel like the coverage works well on both for me as I don't want a full coverage, I prefer to have a light, medium coverage as my skin is very fair, I have normal skin but this foundation is supposed to be great for ladies that suffer with oily skin so I would check it out. I also watched quite a lot of Youtubers who review this foundation who also had oily skin and they loved it. 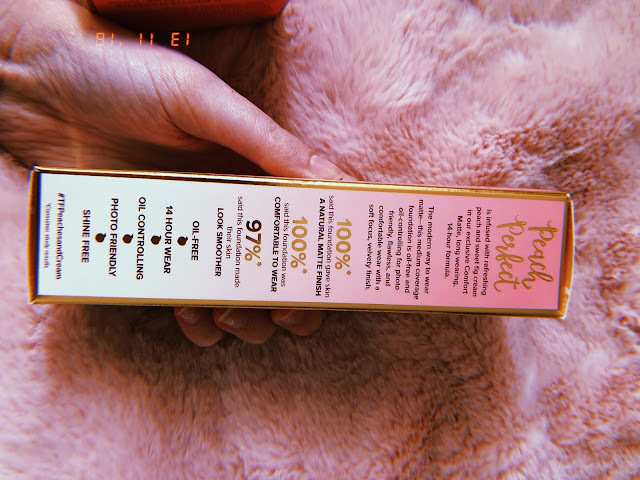 The foundation is easy to blend in, leaves your skin with a very matte finish, it smells devine of peaches and sweet fig however the smell isn't too strong. 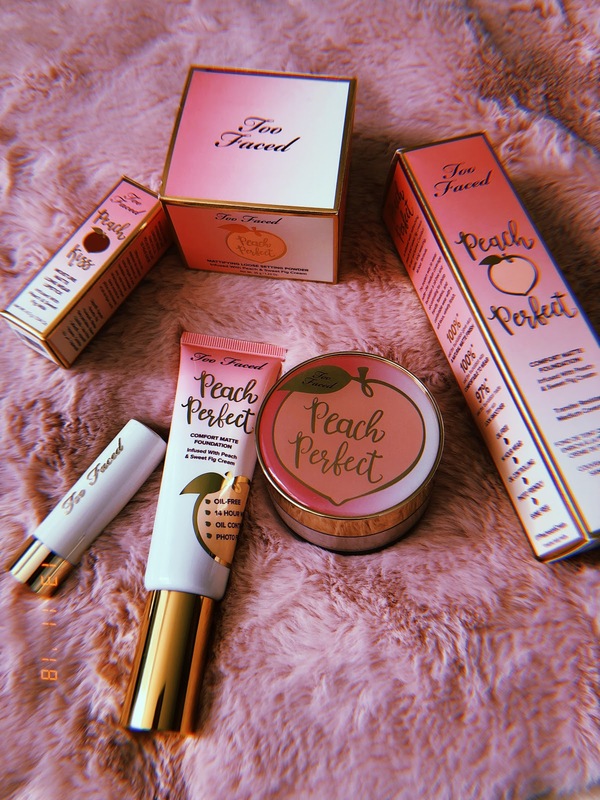 The foundation comes in the same kind of design as the Peach Perfect Primer and comes with a pump which is very easy to use The foundation also retails at £27.00. I used about a 3/4 pumps of foundation onto my face and used to the sponge first on one side just to see what it was like and then used the brush on the other side of my face and I liked both but I prefer to use a make up brush to apply my foundation rather than a sponge..
Too Faced packaging always seems to be the best and they always get it right! I love the packaging always stands out and I must say it always looks very pretty! Universal peach-tinted powder which works to brighten your skin and create a silky smooth matte canvas. Great for under the eye baking. This product is formulated without Gluten and Parabens and is cruelty free. The powder is very well designed, it has the same packaging as the foundation/primer does and has peach perfect on the lid with a cute apple. When you take the lid off the powder, you notice the powder has a clear lid/filter so the powder doesn't go everywhere which I think is a great idea. All you do is shake the product onto the lid (you only need a tiny bit) and boom you are away! 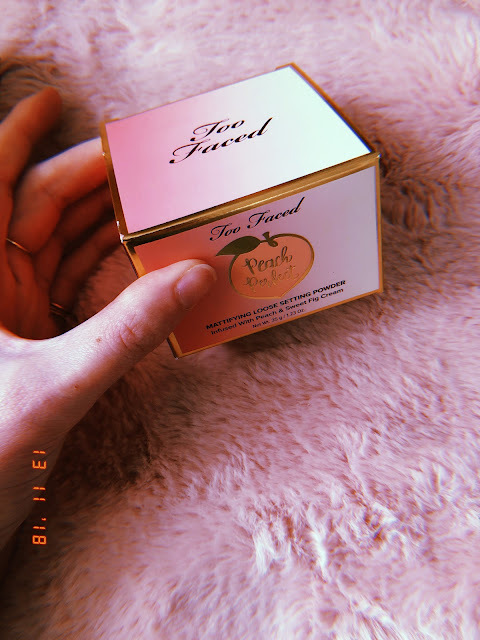 The powder smells devine, it is very very sweet which I love and has a strong smell of peaches and sweet fig cream. I found the powder is very light and as soon as you apply the powder onto your foundation it makes your skin feel so soft. 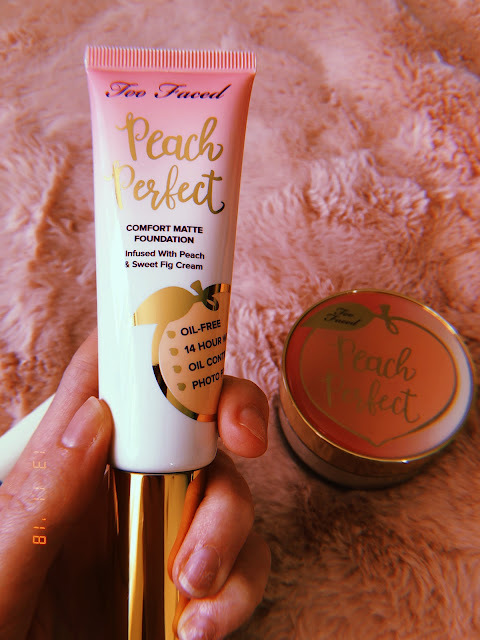 No wonder Too Faced say it is also great for blending. The powder retails for £20 which is a great price as you get so much product in and it will last you a long time! I actually used a sponge to apply the powder which works so much better and as you can get the product right into the corners of your face. Because the powder is loose I find it easier to use the sponge rather than a makeup brush as the powder can be quite messy but apart from that I would recommend both of these products to you all.